Our 36 guest rooms – including single/double rooms and dormitories (female and mixed) – are designed for your comfort and convenience. 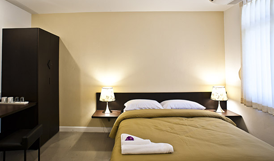 – the rooms also have flat screen TV* and free WiFi. Room features: Queen-size bed, small lounge, flat screen TV and complimentary WiFi. To provide extra peace, quiet and privacy, the Twilight rooms are located at the corner of each floor. Perfect for: Small family or a group of friends (four persons). Room features: Two bunk beds and complimentary WiFi. The Moon4 rooms have a private bathroom that includes a standing shower and wash basin. Perfect for: Individual or group of travellers (up to six persons). Room features: Six single beds and complimentary WiFi. The Sky6 room’s large bathroom includes two standing shower units, three wash basins, and a hair dryer. In addition, each bed is fitted with a reading light and there are six lockers in the room. Located on the second floor, Sky6 is ideal for family or a group of travellers. Room features: Four bunk beds and complimentary WiFi. The large bathroom includes three standing shower units, three wash basins and a hair dryer. In addition, each bed is fitted with a reading light and there are eight lockers in the room.